We are coming back to the world´s leading industrial show, being one of the industrie 4.0 use cases presented by FIWARE and IDSA. Digital transformation and breaking data silos in manufacturing are underway in all aspects of the value chain. In our Zero-Defect Manufacturing use case, Boost 4.0 partners, +GF+, EPFL, CAPVIDIA and INNOVALIA, with the help of Pro-STEP (Product Design Platform Provider) worked together to showcase a secure data exchange across product life-cycle and between factory machines. 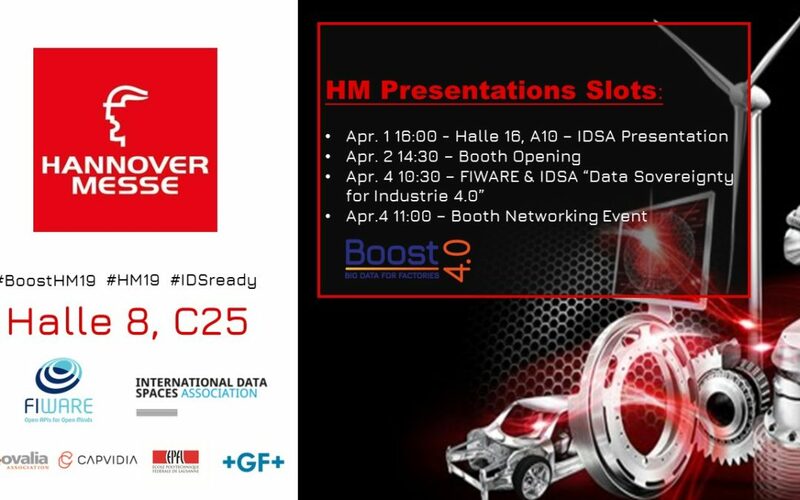 FIWARE & IDSA Networking Event – April 11 am Hall 8, Stand C25. Milling machines and Coordinate Measuring Machine (CMM) are not connected in the current manufacturing status quo. Each of them generates gigantic amount of data but as silos, without being able to be connected and used as manufacturing insights. Under this circumstances, production design and product operation can be sub-optimal. However, to connect them, we are confronted with challenges in data security. To solve that challenge, Boost 4.0 use case implemented IDS-FIWARE connector component to connect 1) digital twin data across the product life-cycle; and 2) milling machine data in the shop floor for Zero Defect Manufacturing. Connecting these two sources of data, product design platforms, product owner and IoT platforms are deployed. The key IDS-FIWARE connected ensured the data sovereignty, ensuring that machine provider maintains the access control terms and conditions while shop floor operator controls what data is being exchanged and goes out of the factory. The benefits are huge and fulfill the visions of industrie 4.0. Connecting data and breaking the walls in data silos have improved and integrated product and manufacturing process performance. Design for manufacturing value, smart zero-defect manufacturing services and design for product performance are realized. The use of IDS connectors guaranteed data security for product owner and engineering department, as well as the confidentiality of information. We are fully aware that evolutional change awaits us in a connected manufacturing world. Boost 4.0 use case forms a small step to the big vision of smart factory and smart manufacturing. By implementing the IDS-FIWARE Connector component, we´ve bridged the security gap by countering data security risks with IDS connector. We´ve seen impressive progress in the immensity of use case impacts and the improved performance of the connected data after one year after the project started. Don´t forget to visit at: Hall 8, Stand C25. See you at Hannover Messe.